A fume extractor is a system utilizing a fan to pull fumes and particulate into a filtration system cleaning the air of harmful chemicals and particulates. Industrial processes create fumes or particles such as welding, sanding, grinding, spraying, powder filling, and chemical applications. Fume extractors use a variety of filters while some systems, depending upon application, use multiple filters in line. The combination of the powerful fan and high-quality filtration media creates a recirculating air pattern for ductless units. Because of the air flow, ductwork or costly replacement air is not required. These units take up less space, weigh less, are more energy efficient, and have easy access to change filters. 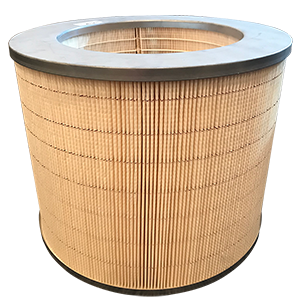 Particulate filters utilize high efficiency fiberglass media to arrest and intercept particles, light dust, smoke and other airborne particulate. This type of filter is used to prevent asthma, allergies causes, and prevent disease spread. Uses: Particulate control, light dust collection, bacteria laden air reduction, other respirable particulate and dust control. Types: Differs on efficiency. 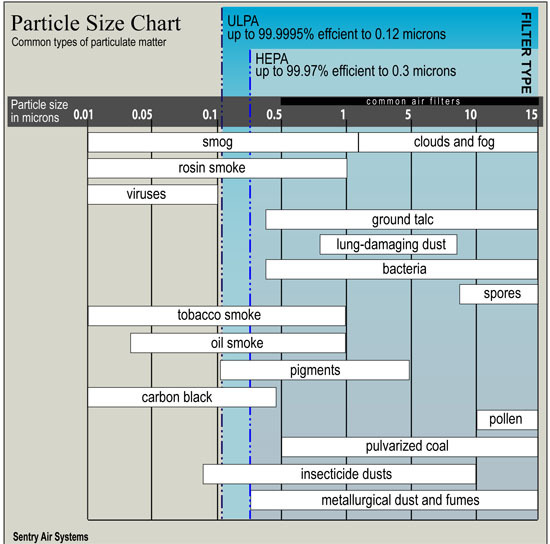 See chart below for overlap of HEPA and ULPA filters and sample particulates captured by both. • ASHRAE Filter (Up to 95% efficiency on particles 0.5 microns in size) – lowest quality that meets standards set by American Society of Heating, Refrigerating, and Air Conditioning Experts. Not as efficient as HEPA but used for similar purposes. • HEPA Filter (Up to 99.97% efficiency on particles 0.3 microns in size) – high filtration levels to catch small particulate to prevent asthma and allergies. 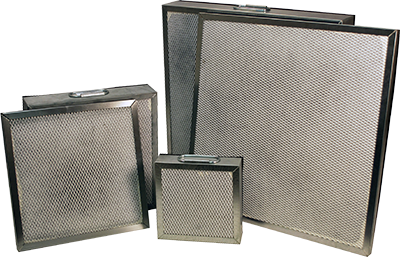 • ULPA Filter (99.9995% efficient on particles 0.12 microns in size) – ultra low particulate filter has better filtration than HEPA catching more particles smaller in size than HEPA. For activated carbon and specialty-blended filters, the efficiency depends on the chemical being adsorbed and the application. These types of filters are used to adsorb organic vapors and solvents. Activated carbon has millions of pores that create a large surface space to adsorb odor and chemical fumes. These types of filters do become saturated and must be replaced to optimize efficiency. Sentry Air Systems uses organic virgin coconut shell activated carbon which is the highest quality available. Uses: To adsorb chemical fumes, organic vapors, and solvents (i.e. acetone and formaldehyde). For more information about activated carbon chemical adsorption rates please view our chart. 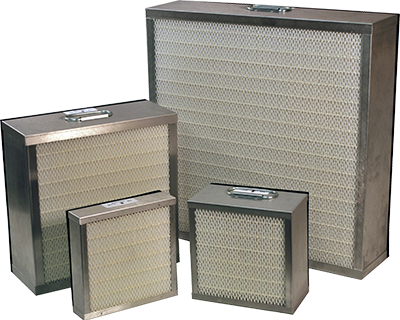 Micro-Pleat or Cleanable filters can be cleaned by applying pressurized air to the exterior of the filter. These filters are easy to clean because they do not need to be removed while cleaning. The waste from the cleaning process will fall into the internal dustpan for easy removal. These types of filters are best utilized for high volume applications where filters become easily saturated. Unit shown is 300 Series Portable Floor Sentry Single Fume Extractor (SS-300-PFS). Portable Fume Extractors are compact, lightweight and have a small footprint design. Portable fume extractors are available in a variety of sizes and air volume configurations. • Variety of source capture arms, self-supportive or flexible hoses that can be configured for single or multiple operators (1, 2, or 4 users). Uses: welding, grinding, soldering, brazing, 3D printing, powder collection. Benchtop fume extractors sit close in proximity to the application or fume making process. These units have small footprints and take up minimal amount of space on the work table. Benchtop fume extractors come in a variety of air volume capacity as well with or without wings. Shelf or enclosure mounted fume extractors are compact units and do not require external ducting because the air is recirculated back into the room after filtration. These systems may have one to two hoses to help direct air flow or will be mounted close to the source of the fumes. These fume extractors can be mounted on the machinery for optimal filtration. Uses: Laser Marking, Chemical Fume Extraction, Particulate Control, Printing Fumes, Soldering, Solvent and Epoxy Fume control, Fume/Vapor Source Capture, and a variety of other applications that produce smoke, dust, or particulate. Wall Mounted fume extractors require no floor space but need an extended arm to capture the fumes. The arm or hose can be free-hanging or self-supporting flex arm in order to be moved by the operator to catch the fumes at the source. Uses: welding fume extraction, solder fume control, brazing, particulate, removal of organic vapors, solvent and epoxy fumes, chemical fumes, light grinding, and various other industrial processes where a wall-mounted fume extractor is needed. Stand mounted fume extractors are ideal for elevated source capture when wall mounting is not possible. These types of fume extractors are perfect for oversized machinery, open concept workspaces, or when the users do not want to take up valuable floor space. Stand mounted fume extractors are available with a flex arm that has 62.5” swivel radius or a hybrid arm that is ideal for high heat applications. Uses: Welding Fume Extraction, Laser Fume Control, Chemical Fume Extraction, Pharmaceutical Powders, Particulate Control, Printing Fumes, Soldering, Solvent and Epoxy Fume Control, Fume/Vapor Source Capture, Light Grinding, and various other industrial processes. Why you should use a fume extractor? Fume extractors are necessary to meet the Permissible Exposure Limits (PELs) set by OSHA (Occupational Safety and Health Administration). Adhering to PELs is required by law and if found otherwise by a surprise inspection from OSHA, the organization will possibly get a citation with a deadline to fix the issue or be subject to pay fines. If OSHA conducts an inspection due to a workplace accident, immediate fines will apply to violations. Not only to follow the law, fume extractors can help organizations avoid legal issues, improve employees’ health and safety, and increase employee morale. Expensive law suits from chemical exposure could bankrupt a company or substantially damage it. Employers should care about the employees’ health and safety to maintain a productive workforce. Employees’ satisfaction and morale will improve because they know that their employer cares about their safety and health. For the PELs of specific chemicals, please refer to the OSHA Annotated Table Z-1. For information about the NIOSH (National Institute for Occupational Safety and Health) Recommended Exposure Limits(RELs) please visit their website for the NIOSH Pocket Guide to Chemical Hazards. Some common chemicals have been listed below for reference.